Beachside Girls Soccer team members. BRIDGEPORT — Parents of girls in the Beachside of Connecticut Soccer Club did not hide their frustrations Monday night, when they were told this is the last season their daughters will play for the group. 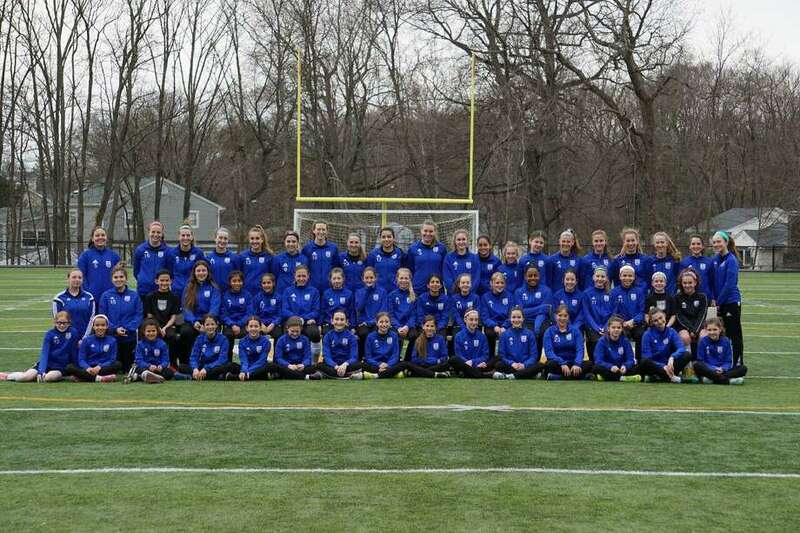 At its meeting at the University of Bridgeport, the Norwalk-based club’s board of directors announced the suspension of the girls program, leaving dozens of girls without a team to return to next season. Although the demand seems to still be there, the premier soccer club is cutting the girls teams because board members claim they cannot find proper fields to accommodate them. The teams, which consist of many Westport and Norwalk residents, have roughly 70 to 75 girls, according to the parents in attendance. McNair explained the decision came after trying for two years to find a solution to the fields problem. These struggles were highlighted by losing use of several fields throughout the years, including one in New Canaan, he said. Parents were assured by McNair the decision was not based on economics and that the girls program remains profitable. But some of the 20 or so parents at the meeting weren’t convinced the board was trying hard enough to keep the girls teams alive. “If they really did care and if it was something that they were truly working on, when they came into this room they would’ve offered other teams that we could have gone to potentially,” said parent Kathy Tate, who pays at least $3,000 to have her child on the team. Tate noted her daughter wouldn’t go back even if they reopened. Juliette Spelman, who played soccer in the 1980s, said she benefited from Title IX when she played Division I soccer in college and it was the first time she felt women’s programs could have solid ground. She found it surprising that, 40 years later, her daughter would have the same fight. Aside from turf availability issues, board members claimed the tier at which the girls teams were allowed to play is another cause for ending the program. The club applied for academy status through the Elite Clubs National League twice and were rejected each time, according to the board, partially because they do not have enough players for each age group. Because of this, McNair said, the girls are relegated to play in second- or third-tier leagues. In response, one parent expressed concern with the club’s want for academy recognition over providing the girls with strong principles that soccer provides. Meanwhile Westport resident Kristen McDonald expressed confusion over field availability being the reason for the program’s suspension. McDonald, who had two sons in the program and currently a daughter at Beachside, said she is pleased with the coaching, and that practices were never canceled and were as frequent as three times a week. She also doesn’t recall the board ever asking parents for help with these issues in the last two years. McDonald and other parents also questioned why Mickey Kydes, the founder and director of coaching at Beachside, was not in attendance. “We deserved his respect and a face-to-face,” she said. One parent explained how devastated her child was, and asked McNair if they would be able to try out for the boys team. He said yes. The current 10-member board was formed in 2014, according to Beachside’s website, and consists of volunteers, alumni, parents and parents of alumni. Two of the members previously had daughters on the Beachside teams, and McNair said the decision was not an easy one for them. “They felt very strongly about what we were doing and the message we were sending,” he said. McNair declined to further comment on the program suspension. Where will the girls go now? News of the suspended girls program has prompted Girls Coaching Director Ferid Zimic to open his own all-girls soccer club next year. Zimic plans to merge a couple of local girls soccer clubs into a new club, which will be named soon, as tryouts in Connecticut are just around the corner. “How could someone like Ferid get it done and you guys can’t?” Westport parent Monika Kovics asked the board during the meeting. Kovics, who has a daughter in the Beachside team, said she was beyond thankful for Zimic’s efforts in organizing a place for the girls to go. On telling her daughter the news of a new team, McDonald also expressed gratitude that Zimic had a plan in place. Although she said girls are resilient, given her daughter’s soccer history and having two brothers that also played at Beachside, it hurts. Zimic, who will be employed by Beachside for the next three months, would not comment on the issues raised in the meeting, but said there will be an advisory board in his new club where the opinions of parents will be heard.